Before you invest in an X-ray detection system, wouldn’t it be nice to test the equipment to see if it meets your needs? Fortunately, X-ray equipment suppliers offer a common lab test, called an “application test,” which replicates your production line and scans your sample products. You will learn exactly what the X-ray system can and cannot do before you make a purchase decision. What do you need to know about the application test? Why should I request an application test? Where is the application test performed? The application test usually takes place at the supplier’s lab, where your production conditions are replicated as closely as possible. Some suppliers may also bring their system to your facility to test under your exact conditions and demonstrate their system capabilities. What do I need to provide for the application test? The goal in application testing is to replicate your production line as closely as possible. The more specifics you communicate about your products and operating conditions, the more accurate your test results will be. The supplier will need a complete list of your products from the line being considered for quality control. For each product, include height, width, depth, and weight so the supplier can suggest the right system, one that can accommodate all product sizes within the imaging area of the X-ray system. To replicate your production conditions, at a minimum, you should provide the line speed (packs/products per minute) and the inspection location on the line (see section 4 below). Also inform the supplier if you have any unusual temperature specifications (e.g., frozen or partially thawed product) for a product during production. Finally, a photo or short video of your production line can help a supplier simulate your operating environment. If you plan to compare results for different suppliers, be sure to provide consistent line specifications to each supplier and know the densities of the foreign objects used. For example, there are many varieties of “glass” foreign objects. Make sure the density is the same if you are comparing test results from different suppliers. For accurate results, consult with your X-ray equipment supplier to determine the right number of product samples needed for your test. Usually application testing requires 5 to 10 samples of each test product but there might be factors that affect the number of samples needed. Glass and stainless steel are the standard contaminants tested. Since X-ray detection is based on using density to find foreign objects in the products, the application test results are tied to certified foreign object samples with a proven density. But, providing the supplier with potential foreign objects from your production helps to determine what other contaminants you may detect with X-ray. What is the best location on the production line for X-ray scanning? X-ray inspection should occur after the package is sealed and once there is no further opportunity for contamination. Producers then determine where to place the X-ray equipment, how many points of inspection to establish, and at what packaging level (e.g., primary or secondary) they will conduct X-ray inspections. Primary level refers to inspecting a product after it is sealed in the first layer of packaging. Secondary level refers to inspecting packaged products which are consolidated into cases or a second packaging unit. While it may be tempting to install as few units as possible and scan for contaminants as close to the end of the packaging process as possible, primary packaging inspection is more reliable and cost-effective than secondary packaging inspection. How do results compare for primary and secondary packaging detection? 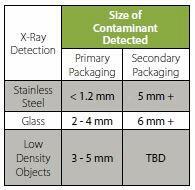 X-ray scanning at the primary packaging level provides the best contamination detection rates (see table below). Inspection at the primary level can accurately detect metals sized at less than 1.2 mm (about 1/32 inch), and low-density objects like glass as small as 2 mm to 4 mm (about 1/16 to 3/16 inch). In the worst case, inspection at the secondary level may detect metal objects down to 5 mm to 7 mm (about 3/16 to 1/4 inch). As an example, a metal washer from a filling machine could be detected at the secondary level. What are the major differences between X-ray and metal detection? X-ray systems identify contaminants based on density differences. Thus, X-ray detects a broader range of foreign objects than metal detectors. High-density objects, including glass, calcified bone, stone, stainless steel, and hard plastics are detected by X-ray with high accuracy. With lower-density objects, accuracy depends on the food product. Thus, testing with your exact products is important. Metal detectors utilize magnets to detect metal foreign objects, whereas X-ray utilizes software programmed to define the density of the object being inspected. Therefore, inspecting products with metalized film or aluminum packaging are no problem for X-ray inspection. X-ray systems will not forget your product once it is learned. During initial set-up of an X-ray system, a product is taught to the system five to ten times depending on the system. Once the system learns your product, you do not have to reteach it. This is another key difference between metal detectors and X-ray detectors. Metal detectors often need to be recalibrated. What can I learn from the Application Test Report? applications of any software inspections, in addition to foreign object detection, that can improve the quality of the product (e.g., counting, virtual weighing, missing items, overfills, underfills, length of product, shape of product). Do I need to be present for the application test? Customers are not required to attend, but are welcomed. Some customers participate in the application test to learn about the user-friendliness of the equipment. Are you considering an upgrade from metal detection to X-ray detection? 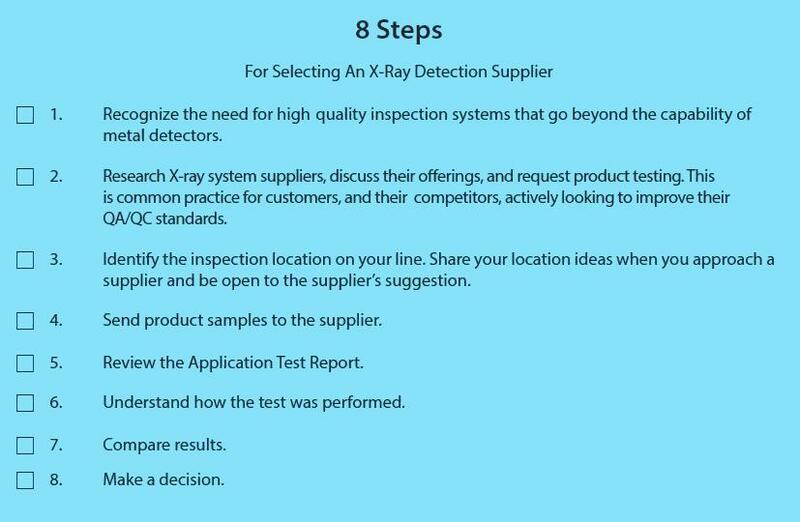 See the sidebar checklist for selecting an X-ray detection supplier. 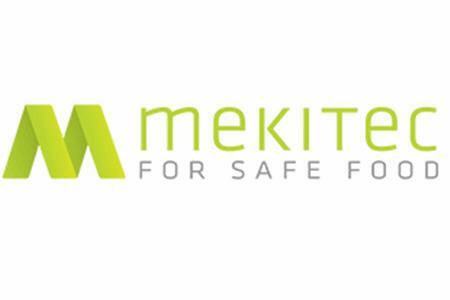 Mekitec has combined experience spanning several decades in the development, industrialization, and manufacturing of X-ray imaging systems in medical, security, and safety areas. This unique combination of in-depth knowledge of various industries has enabled the management to invest in long-term research and development, especially for the food industry. The results of this focus and dedication are the state-of-the-art X-ray food safety systems that Mekitec supplies to its customers globally. The MEKI X-ray inspection system helps maintain consistent product quality to HACCP and FSMA standards. Through offices in the U.S., Europe, and Asia, it continues to expand its sales and support network globally.